The Voice is a talent competition that airs on NBC. 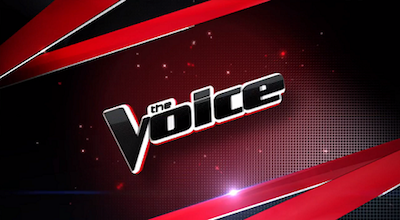 Its source material drawn from The Voice of Holland, The Voice entered the reality singing competition landscape in 2011 as an alternative to Simon Fuller's American Idol and Simon Cowell's The X Factor. Unique to the show's format are its initial Blind Auditions phase, where the four coaches pick contestants for their live shows based on an audition that they can hear, but not see. The show navigates several differently formatted rounds thereafter, eventually reducing each coach to a select group of contestants for the live shows phase. The American public then votes via SMS, phone, and iTunes purchases to crown a winner, who is awarded $100,000 and a recording contract with Universal Music Group and its subsidiaries. Since its inception, The Voice has consistently been NBC's best performing program and currently airs two complete seasons every year. Past winners of the show have been Javier Colon, Jermaine Paul, Cassadee Pope, and Danielle Bradbery. The current judging roster for the Fall 2013 season consists of Blake Shelton, Christina Aguilera, Cee-Lo Green, and Adam Levine. Shakira and Usher are expected to replace Christina Aguilera and Cee-Lo Green, respectively, for the Spring 2014 season. Its current host is Carson Daly.